State lawmakers want stricter oversight of private colleges after Mount Ida College in Newton closed unexpectedly last year. Newly proposed guidelines could make schools prove their financial stability and penalize colleges that choose not to comply. School leaders say the regulations will make things worse for small colleges. In Amherst, Hampshire College has chosen not to admit a full class this fall and hopes to merge with another institution to avoid closing its doors. Hampshire President Miriam Nelson joined WBUR's Morning Edition to talk about the future of the school and others like it. Here are some highlights from the interview, lightly edited for clarity. Former [Hampshire College] President Jonathan Lash told you that the school was facing enrollment problems just after you accepted the job in April of last year. Have you been preparing for this possibility since then? Yes. On May 2, President Lash did call me and let me know that we had not met our target numbers for enrollment. That was on the heels of two other years of lower enrollment. So I knew in May — even though I didn't start until July — that my timeline was going to be condensed, and it was important to really get a firm understanding of our finances and our place in higher education. So I got to work on that very quickly. Did you feel like you had enough warning from President Lash about the school's troubles? I've been in higher education now for over three decades and am very aware of the sort of disruption that's happening for small colleges that are under-endowed. So even before that time when he called me, I went into this with my eyes wide open. Let's talk about the financial stress test. It came up as a way to stop abrupt school closures, like what happened about Mount Ida College. Do you think it's a good plan or perhaps that it goes too far? I'd really rather not comment on the plan because it's very much in the works. What I will say is that I do feel it's really important that there is full information for these students and that, if a college is going to be taking students, that they have the confidence that they can teach those students for the four years or beyond that those students are at that college. So I really value that discussion that is happening in higher education. It's way too premature to comment on any of the actual particulars because they're just working on that now. 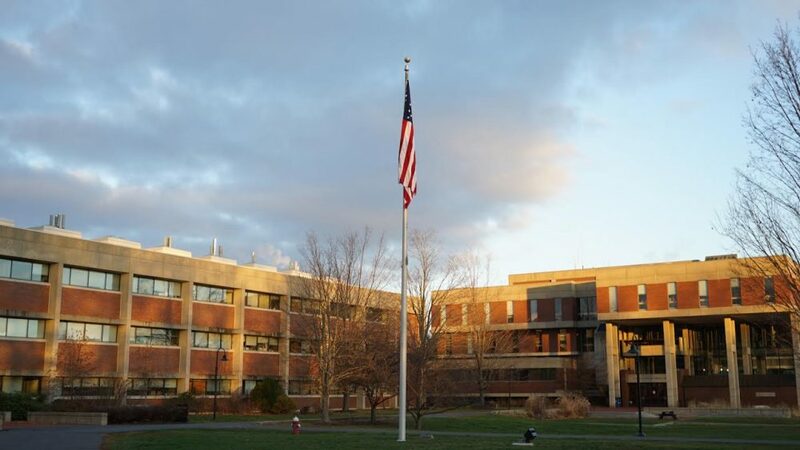 Hampshire College just got a new 10-year stamp of approval from the New England Commission of Higher Education despite financial concerns. Do you think the commission missed something? No, they did not miss something. We're in very close contact with NECHE. They've been very supportive. Our educational model is as sound as it gets, and we provided very important details for how we were going to be making sure that we are financially stable. Unfortunately, what happened following our accreditation is that our enrollment has continued to decline. So now [we're] looking at how we pivot and make sure that we maintain this educational model as we look to find a partner. But these are not easy times right now, and we're going to have to be doing some downsizing as we go into the next year to ensure that we balance our books and come out of this stronger. Critics wonder if you could have taken more time before you made your decision to not admit a class this fall. What do you say to that? We would have loved to have had more time, as you can imagine. But right now, we don't have the confidence that we can teach the incoming class for four years, as is the college's promise to those students. As we look for a strategic partner, we expect to look different within the next two years. So it just seemed like the absolute right time for us to be making that decision. Could your decision have consequences like making students doubt whether they should apply to Hampshire College in the future? We will come out stronger, but we're going to have an unsettling year and a half to get there. So I hope we can really build that confidence back with people. And I think with a good sound partner we should be able to do that. You've said you hope to preserve Hampshire's vision for education. But many faculty members could lose their jobs in a merger. We hear that staff layoffs could happen as early as Friday. Is that what's coming? Just to be clear, we were looking at faculty and staff layoffs regardless of whether we took in a new class or not because of our lower-than-target numbers. So that was in the works anyway. We are right now looking at our process and understanding what the needs are, and the first round of layoffs with staff could happen as early as Friday. We're not exactly sure of the date yet, but that's what we're working towards. Fewer high school graduates are applying to college, making competition for incoming students more difficult for smaller institutions such as yours. With all these new financial measures, are small private colleges in trouble across the board? Well, I think some of it depends on what the endowments are. There are very large endowments for many of the small private colleges. They then have what I would call a diversification of their funding sources because they have much higher endowments than we do. So I think schools that have low endowments are the ones that have to be more innovative in their thinking about the future. There's a real downward push on tuition revenue right now because of competition and fewer students graduating from high school. So a lot of work to be done. Are you confident that Hampshire's unique mission survives all this turmoil? That is what I'm fighting for right now. I believe that our educational mission is more valuable now than it was 48 years ago when we were founded. But these are really interesting times. It's important that we locate a partner who values that.